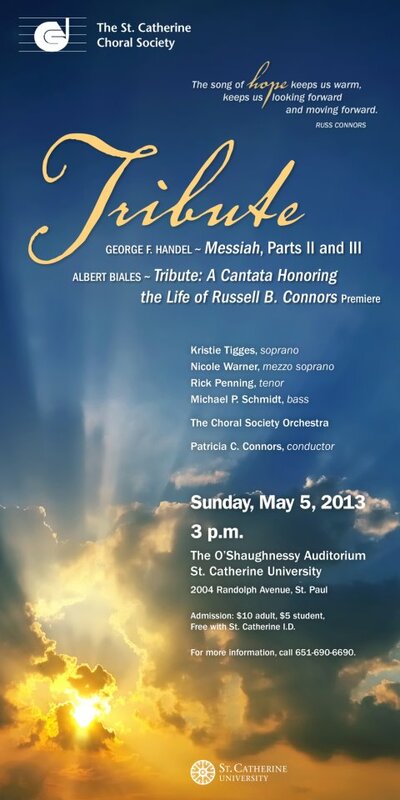 The St. Catherine Choral Society will be premiering Tribute: A Cantata Honoring the Life of Russell B. Connors, 1948-2011 on Sunday May 5th, 2013 at 3:00 pm at the O’Shaughnessy auditorium on Campus. Tribute was composed by the late St. Catherine University Professor Emeritus Albert Biales, who passed away shortly after completing the cantata, to commemorate the life of Russell Connors, a Theology professor who passed away in July 2011. Dr. Connors was a charter member of the Choral Society and the husband of Patty Connors, the Choral Society’s conductor. By The Roaming Food Scientist in Uncategorized on April 23, 2013 .